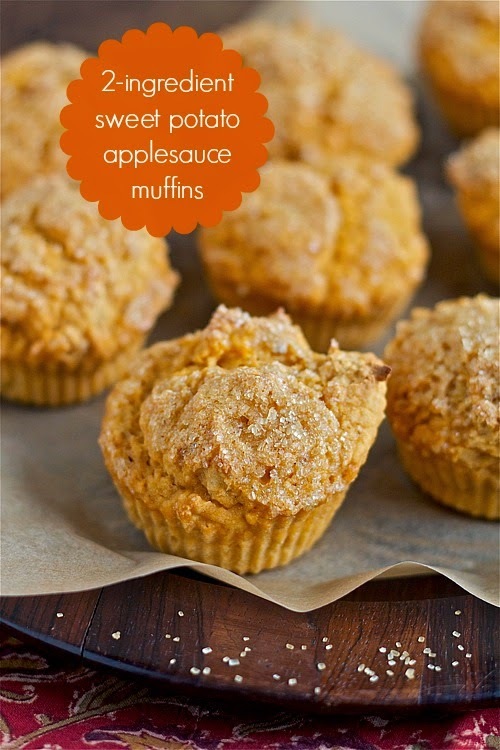 Enjoy these quick-and-easy sweet potato applesauce muffins as a healthy breakfast or snack. No lie: They're made with only two ingredients! Last week, I shared with you the delicious results of one of the best aha moments I've had lately: slow cooker sweet potato applesauce, made with naturally sweet apples and sweet potatoes and no added sweeteners. Squeeeeeeee! Pretty awesome, right? And healthy to boot. But wait -- there's more! A few of you mentioned in the comments that you loved the idea of adding sweet potatoes to applesauce but you weren't quite sure how to best use it (although the suggestions of pairing it with roast chicken or pork were fabulous!). Come on: Did you think The Ninj would leave you hanging? And hanging with a boatload of applesauce on your hands? Behold: Use your healthy sweet potato applesauce to make these super simple muffins -- and they only require one other ingredient. Seriously, how cool is this? Turn one healthy snack into another, with very little effort and without sacrificing any of the healthy factor. 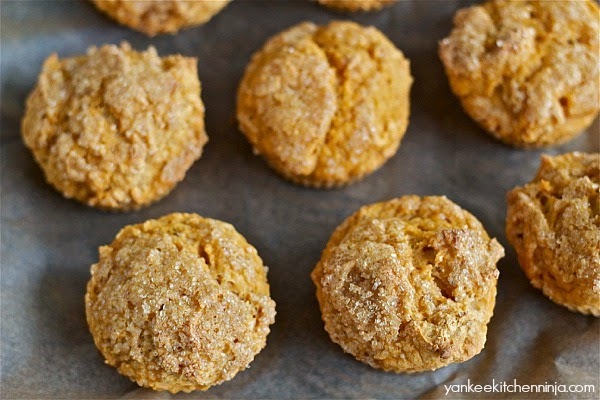 All it takes to bake up a batch of these not-too-sweet muffins is to combine the sweet potato applesauce with some self-rising flour. Presto: That's it! You'll really want to plan to eat these muffins, warm from the oven, spread with a little creamy salted butter. OK, go back and read that sentence again. That's a pretty heavenly breakfast right there! And if you opt to top them with a little coarse sprinkling sugar before baking, as I did, they can also do double-duty as the perfect portable afternoon snack (pair them with a nice cup of tea -- you won't be sorry). Now, remember I mentioned that the sweet potato applesauce freezes well? Freeze it in 2-cup portions and you'll always be just a wee bit of thawing time away from whipping up a batch of these quick-and-easy muffins. Have you tried my slow cooker sweet potato applesauce? Do you have any left to give these easy muffins a try? Leave a comment: The Ninj wants to know. In a large bowl, blend together the sweet potato applesauce and the flour, stirring until well blended. Spoon the batter into a prepared muffin tin, filling each cup about 3/4 full. Sprinkle tops of each muffin with coarse sugar, if using. Bake for about 25 minutes or until a toothpick inserted into a muffin comes out clean. Cool for a few minutes in the pan before removing to cool completely on a wire rack. I am totally digging these! Love the combination of sweet potato and applesauce! It's all-natural sweetness, Nancy -- you'll love it. Oh yum, that sounds great!! Cat, the recipe has TWO INGREDIENTS, so yes, I'm sure I got it right. :-) Sorry they were denser than you'd hoped. Perhaps the consistency of your applesauce was a bit different than mine? I've got my sweet potato applesauce cooking up in the crockpot right now. I will have to try these! Hope you enjoy them, Karen! I had a hard time saving 2 cups of the sweet potato applesauce when it finished cooking, but so glad that I did! I made the muffins this morning and have already polished off 3 of them. YUM!